Vacation rental house. 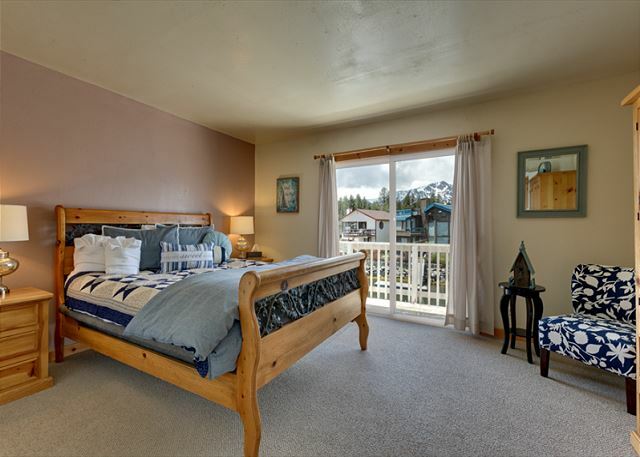 Sleeps 12, 4 bedrooms, 2.5 bathrooms. No pets allowed. 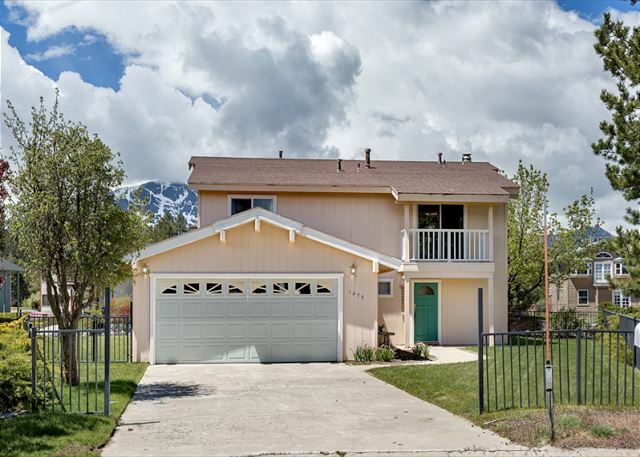 This 4 bedroom 2.5 bath house has amazing views of Mt. Tallac and is on the water in Tahoe Keys. 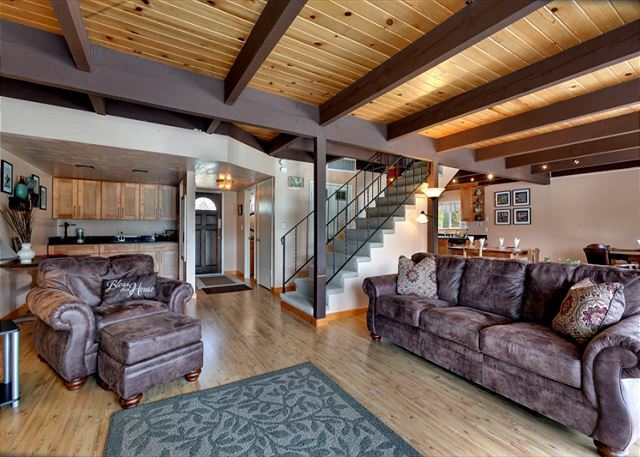 This home is perfect if your family is coming to Tahoe for a boating weekend. The boat dock will accommodate 2 boats. There is a big deck facing the water that is great for a relaxing dinner or just to hang out for the day. On the first floor is the kitchen, living room, dining area, wet bar & 1/2 bathroom. The living room and dining room are lined with sliding glass doors from wall-to-wall that open up to the deck and keys water way. There is a bumper-pull table that doubles as a card table, perfect for game night. Living room does have a sleeper sofa. 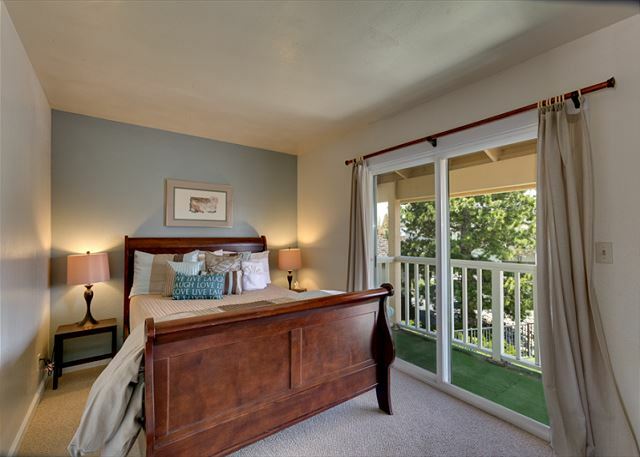 On the second floor is bedroom 1) master with a king, TV, full bathroom and a deck that overlooks the water and the mountain. Bedroom 2) with a queen. 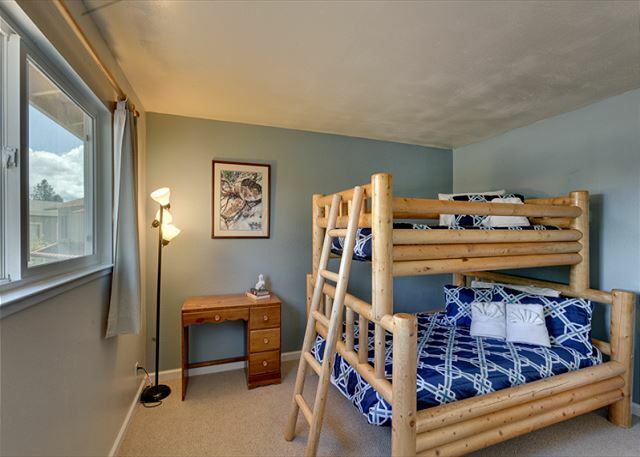 Bedroom 3)with bunk beds, full on bottom and twin on top. Bedroom 4) with a queen. There is also a shared full bathroom in the hallway. 4 cars parking max. 2. You are only allowed 12 persons at any time at the house. This includes any dinners or gatherings you may have. There is only sleeping for 11 in beds. 73 % of our reviewers would recommend this vacation rental. This house was just as advertised. Plenty of space for our 12 guests. 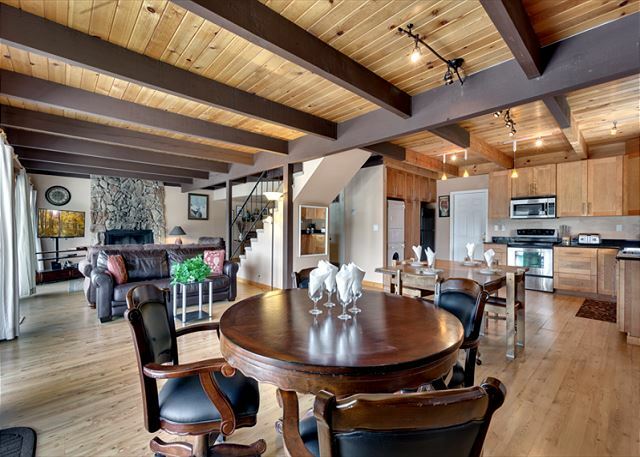 Great open concept floor plan and nicely furnished throughout. Only a couple of drawbacks. The upstairs shower/tub was missing the lever to allow for shower operation. That lead to one shower for 12 peolple. Lucky we were only there for the weekend. The heating was inconsistent throughout the upstairs. Some rooms were like saunas, while the master was an ice box. Otherwise this was a greta place to stay, and would consider again in the future. It was a nice clean place where my family of 12 enjoyed. Great view and close to most all places. quiet neighborhood. My family, friends, and I stayed here during new years weekend. It was perfect! The neighborhood was very private and quiet but not too much to make you feel like you had to walk on eggshells. My group played plenty of board games and shared laughs without feeling too loud. The home was very clean the and views from the back decks are breathtaking. Overall a great stay and I would love to go back during the summer to put the private dock to use! Thank you for renting from us. We hope to see you this summer. Beautiful Home with an amazing view. Enough sleeping room to accommodate 10 people. The only downside is the sound proofing. If people are loud downstair, you will hear them through the floor. I'm glad we could make your first Vacation Home Rental an enjoyable one! I hope you think of us next time you want to vacation in Lake Tahoe! Great location and great house! It was so quiet and relaxing for an amazing girls weekend with my friends and family. No complaints at all from anyone. a guest from petaluma, CA does not recommend this vacation rental. Overall our experience was moderately good. The property needs a lot of TLC and money put into it. All the beds are hard and furnishings need replacements over time. We did fix their pedal boat and cleaned it and left it at the dock, yay us. The neighbor commented we were the nicest renters in a long time. I think if you posted new pics of the actual property, people would be better knowing what they are in for, just a thought. We also abided by the no street parking and only had 4 in the driveway and garage and still got a warning for the boat trailer in the driveway while we rented 6 nights. Seems a bit over the top, as some security person probably needed to hand out a quota of warnings to protect themselves. And yet at the end of the block there was a motor home parked on the street all week, really!! Thank you for staying with us. If you got a warning that was not from our company, we would have been glad to talk to the person who gave the warning as you were great renters. The pedal boat does not belong to this house. Nothing in the house has changed since we had the pictures taken and it shows the house just the way it is. Scott G from El Dorado Hills, CA does not recommend this vacation rental. The house was okay, definitely built up a little more by the pictures, although the house was in a good location within the Keys. A key watch-out is that the stair railing and 2nd floor railing is not up to code, meaning the spacing between bars is not childproof (no more than 4 inches). For needing 6 hours to prep the house for the next rental, we were not impressed by the level of cleanliness to be expected. If you are new to the Keys (which we were), you cannot swim in the water, nor use any of the property owners association amenities (i.e., pool) without an additional cost. To be fair, the house was not advertised in having usage of the pool, etc., just a heads up. The exterior deck and balcony were interesting. The balcony felt level, however the railing had a significant lean. Also, the beam supporting the 2nd floor balcony between the two columns is warped (first picture of property). Both items were a little shocking/sketchy. I was very surprised how unhelpful the property manager was when asked about the steps needed to launch a boat in Tahoe. If you are advertising a house with a boat dock (which is clearly noted in the title of the house), I was expecting to receive the needed information in order to boat at the Lake. I was not expecting to receive a 10 page document on what is needed/required, however not even receiving internet links from the manager was a surprise (exact email response “I do not have any information on launching a boat into the lake, or inspections, sorry”). Overall, the house was okay, with the highlight being the outside lawn space and Keys location. Would not recommend to a friend solely based on the stair railing if there are little ones, as well as the lake-side deck/railing/balcony. Thank you for renting from us. We do not have any information on launching a boat, inspections for the boat or any other related information about that as we do not run, manage, or operate anything that has to due with that. If we were to give out the wrong information that would not be helpful. We will definitely look into re-building the railings. Great place. Horrible customer service by the gentleman who answered the phones and dealed with our process. Poor attitude easily recognizable through the phone. The house was great, clean and loaded with everything you will need. The location is beautiful, and kids love it with the open spaces. The house is beautiful! But the floor made squeaking noises. House was super clean, beautiful view and great for family and friends! Would stay here again. Beds weren't too comfortable, but still a great experience. It was really good vacation with my friend in Lake Tahoe which is good condition single house. I am really satisfied with good price and well conditioned house. The house was perfect for our weekend getaway. The views were spectacular and it fully accomadated our party. Would definitely stay again. a guest from Los Ranchos De Albuquerque, NM does not recommend this vacation rental. We loved it there it is a beautiful spot house was pretty nice just very dated. Tony M from san jose, CA does not recommend this vacation rental. Marc K from Tustin, CA does not recommend this vacation rental. House description much better than reality. Seemed oriented for winter rental rather than summer. No fans and poor ventilation. Interior nice but sparse. Large black ants every evening. Marginal kitchen with NO garbage disposal. Paint on patio chipping and supporting beam for upstairs deck needed repair. Ramp to dock broken and sunken under 2 ft of water. Old peddle boat broken and leaking. 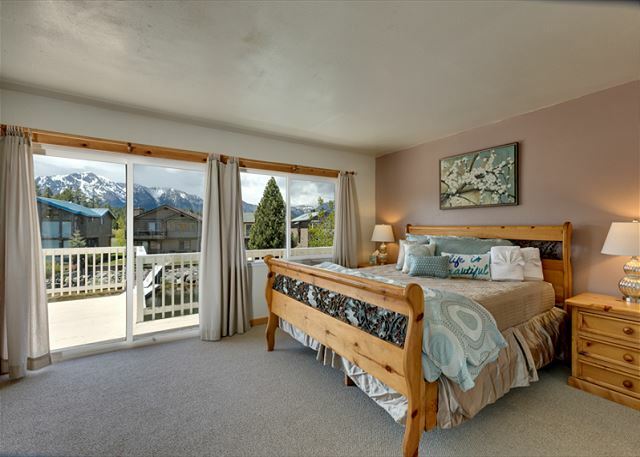 In short, for such a great location, view and the amount we paid, we expected a nice home rather than a dumpy ski getaway. We had a great stay! The house was perfect for the 10 of us that were lucky enough to enjoy the trip, the great weather, and the overall hospitality! The only negative comment I have is in regards to the BBQ. The Grill on the BBQ had not been cleaned in a LONG time which causes a significant amount of debris. When we lit the grill to warm it up for our BBQ, the grill almost immediately erupted in flames. Luckily we were able to safely put out the fire but not to say without a shock.. no big deal just wanted to let you know the grill really should be cleaned more often..
John B from Niceville, Florida does not recommend this vacation rental. heating system kicked on it sounded like a Mack Truck firing up. We definitely will not be coming back. I hate to give a negative review as we also have rental homes in Florida but this home is not a "World Class Property". Nice place - will stay again! the house was very nice. It needs a bit of updating here and there, but nothing huge! The deck railings are bit wobbly, so children need to be careful. The house itself was just as described. It was clean, nice furniture and ready for us when we got there. The kitchen was very nice and was stocked with everything we needed. The location was perfect. close to everything but away from all the tourist hubbub. I would definitely use the property again. Oh and there were bunny rabbits in the yard that greeted us! so cute!!!! Everything was as described. House is very nice, and very clean, with a beautiful view! The house was very comfortable. The beds in 3 out of 4 bedrooms were great. The bunk room bed sagged in the middle so not appropriate for an adult-worked ok for the kids. The kitchen could use some help in terms of storage. There is no where to put your food! Also the place has no basics -salt and pepper, oil, etc. we stayed for a week and had to buy extra garbage bags, TP, PT etc. the upstairs deck was a little shady and we felt scared standing on it. The dock has a big hole in it where the kids accidentally stepped into and could be a potential dangerous spot. Other Han these minor issues the location and layout were great. We had an amazing time! Thank you for staying with us. There are large cabinets next to the fridge in the kitchen that are empty and there is plenty of room for putting your things in them during your stay. We do not supply salt, pepper, oils or anything like that and it states that in the contract that you signed so that you know about it before arriving. The contract also states that we only supply a startup supply of tp, paper towels, trash bags. We have fixed the dock after your group accidentally broke it. We are glad that you had a good time. The whole family stayed for a week in August 2016. House has a great layout. Downstairs is beautiful. Upstairs is really nice too, but a little dated. The dock could use a new ramp with a handrail. Had our boat right in the backyard. BBQ on the deck. Great vacation house. WCP was great too, very responsive and helpful. Deposit refunded in a week. I would definitely recommend WCP and this house. Thanks for everything Jaren! Glad that you enjoyed your vacation. We hope to see you again! Thank you for staying with us. I liked that the house was not cluttered like the Tahoe Keyes rental from last year on Christie but the location wasn't that great. Yes, there was a boat dock but the water was too dirty (probably because too far from main lake) to swim and far back from lake so the water section was small. The house itself: VERY DUSTY, Not clean at all. I had to dust off the bed headboards! The BBQ grill was dirty and had to be cleaned. We paid $225 cleaning that was non refundable and the place should have been sparkling. The garage door opener didn't work; probably needed new battery. Of the two showers one was stopped up. Hated taking a shower in two inches of water! A lot of indoor bugs; gnats and tiny ants. No bug spray around. ALL the knives needed sharpening. Difficult to cut meat. Not even basic spices! Had to go buy garlic salt and regular table salt and sugar. Did have plenty of towels for guests. Only one little ice cube tray in freezer! We arrived at around 4:00 and it was snowing like crazy and freezing but the house was 60 degrees. The downstairs furnace worked but not the upstairs. We called property manager who answered and sent someone to try and fix the furnace. I asked for another property but he said he didn't have anything available. After 2 visits from the repairman got the furnace working but it was on:off all night long. Also the next morning 17" of snow in the driveway. I called and asked they said plow on the way. But got home from skiing and had to shovel driveway to get in. They did come next day with snowblower which helped. And the furnace repair man came again to work on the furnace. He was awesome and the property manager did everything he could to make our stay comfortable but I would not stay at this house again. Needs updating toaster had no handles on it, lights didn't work, floor register broken, utensils and cookware limited. Just not the nicest house we've stayed at in Tahoe for about the same price per night. The house was awesome for our group even in winter when the dock was not needed. The neighborhood was nice and it was a great location! Great house to rent. Having the dock was a huge plus for us. The house was clean, management company was great to work with. After searching & searching online - this was THE PLACE ! 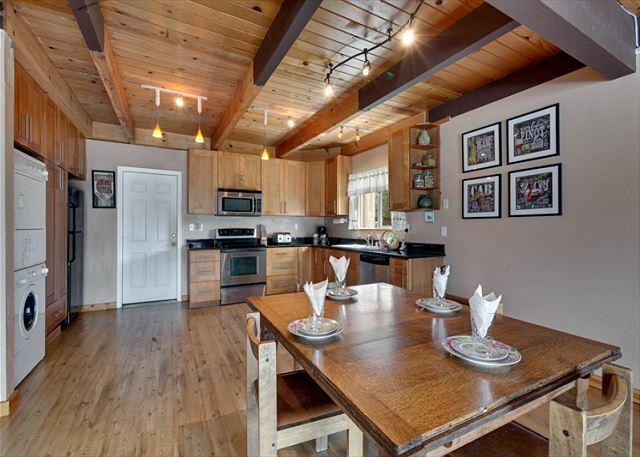 I spent hours & hours online searching for a south Lake Tahoe rental - never been to Tahoe - trying to keep everyone happy (3 adult children & 1 spouse - my husband & myself) for a long weekend visiting our son stationed in the area. The home was perfect - bedrooms spaced for privacy - LOCATION perfect - loved the layout of the downstairs - roomy and allowed for one group to play cards - another reading - while we sat on the deck watching the water. The home was clean - the beds were comfortable. We walked the neighborhood every morning - paddle boarded from the dock (rented the boards). Several times during our stay I heard it said 'Mom you did a great job choosing this place'. This is my first EVER review written for a rental. Bathrooms are bit dated but FINE & CLEAN - drapes could provide some blackout- You will like this place. Written by a picky lady from the south ! Thank you very much for your review. We are glad that you enjoyed the home. Hope to see you again. It was so nice having the boat dock. Lots of room for everyone to relax and the deck was very nice for dinners.